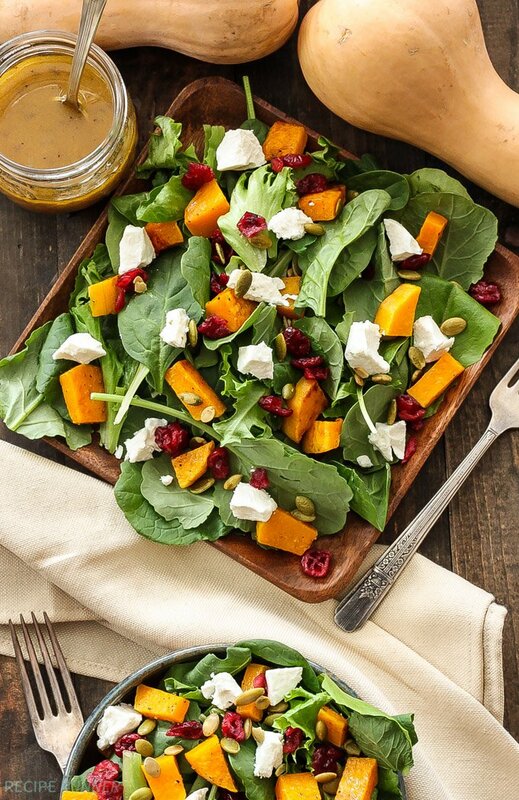 Roasted butternut squash, dried cranberries, goat cheese, and roasted pepitas piled on top of a bed of baby kale. 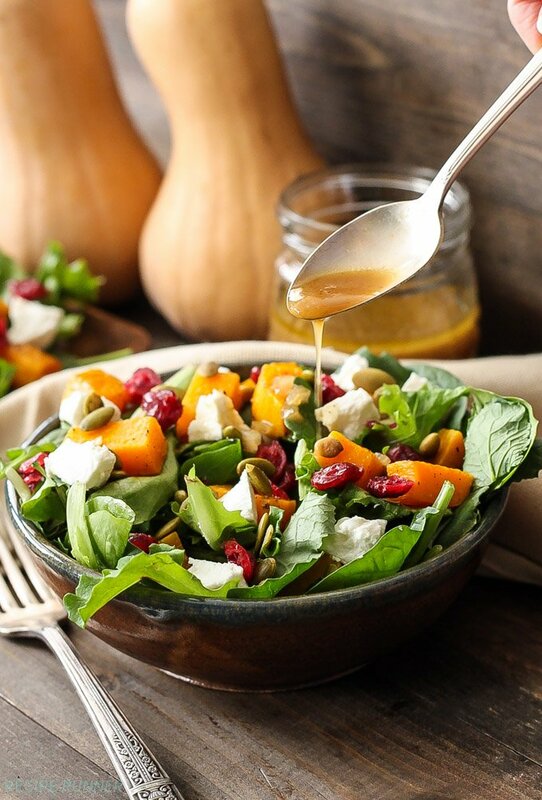 Drizzle this fall salad with cider vinaigrette and be amazed at the combination of flavors! I think our long Indian summer has finally come to an end in Colorado. I couldn’t have dreamed of having more perfect weather up until today. Highs in the upper 70’s even in the 80’s on some days and nothing but sun! Even when we were in Aspen last week the weather cooperated and we were able to hike and enjoy a couple meals outside. Yep, I’m gonna miss those days. Today all that loveliness has been replaced with cold, clouds, and rain. It’s 49 degrees, I’m in my warmest sweatshirt and yoga pants, slippers on, and considering flipping on the fireplace. My cats are curled up into balls and are wishing that I would just go ahead and turn on the fireplace for them. If the sun was out I wouldn’t feel like a bear getting ready for hibernation, but these clouds just make me want to curl up in a blanket and read a good book. On days like this I crave big bowls of soup and warm fresh baked bread. Sadly that’s not what’s on the menu tonight. It’s my husband’s birthday, so dinner tonight was his choice and of course he chose pizza. I’m thankful he didn’t ask for anything grilled because I can’t imagine standing outside in the cold and rain grilling right now. 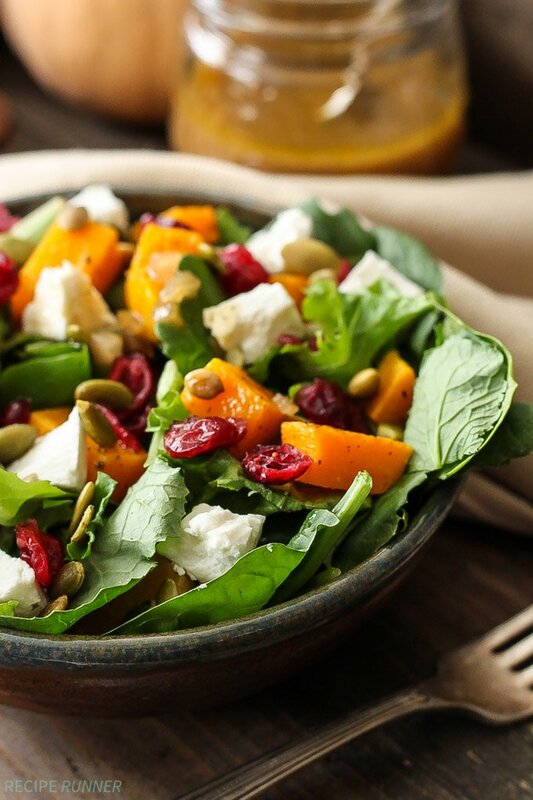 Since I know he will be devouring most of the pizza, I’m also making this Roasted Butternut Squash Salad with Cider Vinaigrette to supplement my lack of pizza. I made this salad last week after I stocked my pantry with several butternut squashes. I absolutely love using squash in dishes this time of year and roasting it is one of my favorite ways to prepare it. Roasting brings out the natural sweetness of squash and is perfect for adding to salads, pasta dishes, or just eating it straight from the pan right out of the oven. 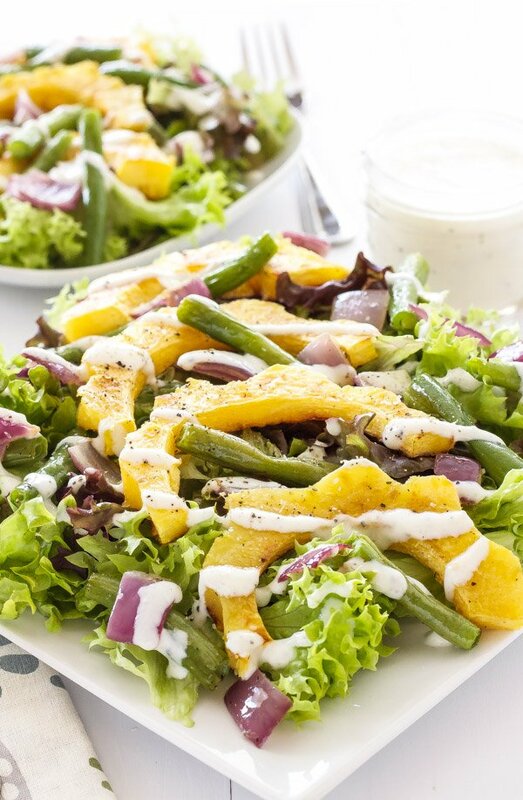 Along with roasted butternut squash topping this salad you’ll find plenty of other goodies. Goat cheese, dried cranberries, pepitas, and of course a drizzle of the cider vinaigrette! 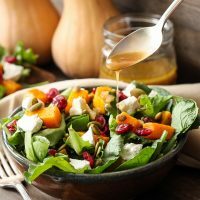 The warm cider and maple flavors in this vinaigrette add a touch of fall to this salad with the perfect amount of sweetness, spice, and tang. I guarantee this salad will be featured on my Thanksgiving table this year! Preheat oven to 400 degrees and line a baking sheet with parchment paper or foil. Toss the cubed butternut squash on the prepared sheet pan with extra virgin olive oil, salt, and pepper. Roast the squash in a single layer for about 15-20 minutes or until tender, tossing it around once with a spatula. Let the squash cool while you assemble the salad. 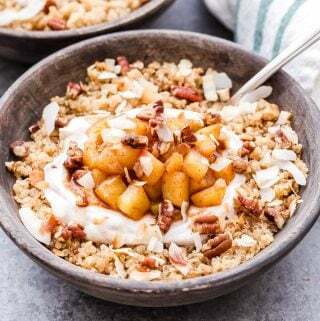 In a large bowl add the baby kale and top with crumbled goat cheese, dried cranberries, pepitas, and the butternut squash. Drizzle with the cider vinaigrette or serve it alongside the salad. In a small saucepan add the apple cider, vinegar, and shallots. Bring the mixture to a boil over medium high heat. Let it cook for about 8 minutes or until it has reduced to a 1/2 cup. 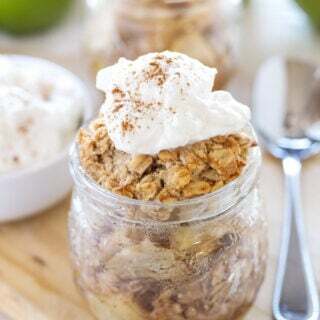 Remove from the heat and pour into a jar or glass measuring cup. Whisk in the remaining vinaigrette ingredients then serve with the salad. To prevent the salad from getting wilted or soggy don't add the vinaigrette until ready to serve or serve it alongside the salad. I have never thought to make a vinaigrette with cider. Totally have to try this! The cider gives the vinaigrette an amazing warm spiced flavor Rachel, I know you'd love it! Thanks you! The cider vinaigrette was so good paired with everything in the salad! When I can eat dishes like this with fall produce, I am happy to say good-bye to summer and welcome in cooler temps. This looks perfect! Same here Kristen. As much as I love all the summer produce, when I can make flavorful and beautiful salads with fall produce I'm just as happy! I make a very similar salad this time of year - it's my absolute favorite! - but have never thought to pair it with a cider vinaigrette. Love this idea!! Thanks for sharing! It's still summer here in Sacramento! It totally hasn't stopped me from roasting all the squash though! 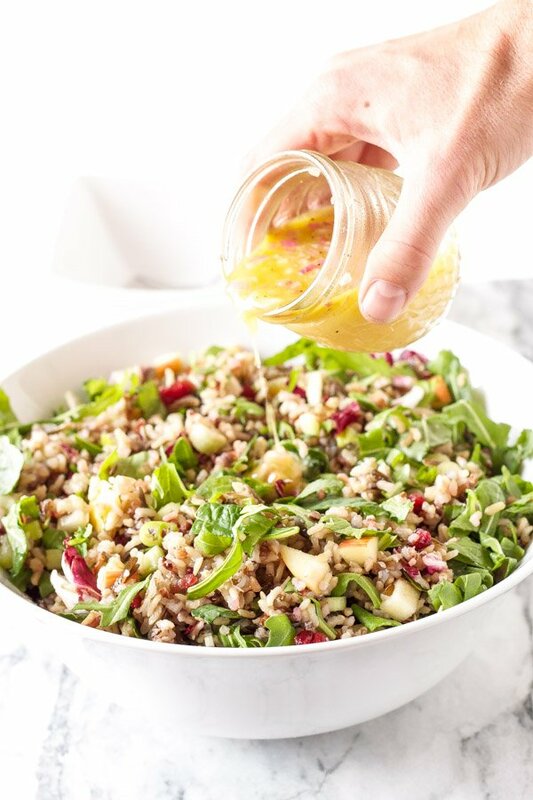 I NEED to try that apple cider vinaigrette! I've been dying for some new salad dressing recipes lately. The cider vinaigrette was definitely a winner Lisa! I'll be keeping it in my fall salad dressing rotation. This is a beautiful salad. I love that you paired the squash, goat cheese and cranberries! I am not sure I could count the many ways I love this recipe! There are too many. First of all, I totally agree about the change in weather making me want soup. And that roasting squash is the best. I also love that you put actual cider in the dressing (I thought it was just cider vinegar.) I have to try it! Pinning! What a beautiful salad! I've been roasted butternut squash regularly lately and love mixing it in with fresh greens. 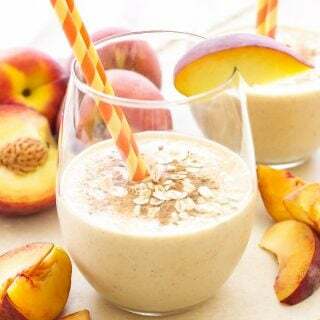 I will definitely have to try this recipe next time! Thanks Ashley! It's such a great fall salad and the tender greens are perfect for using in it! 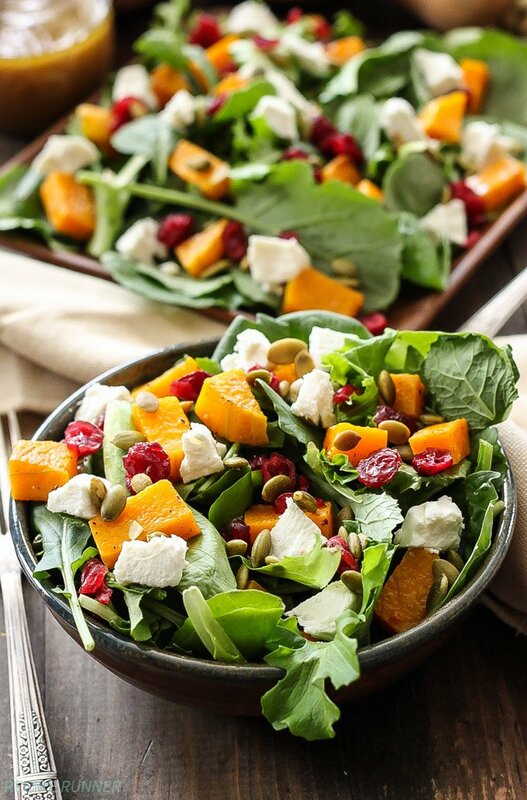 What a beautiful fall salad! 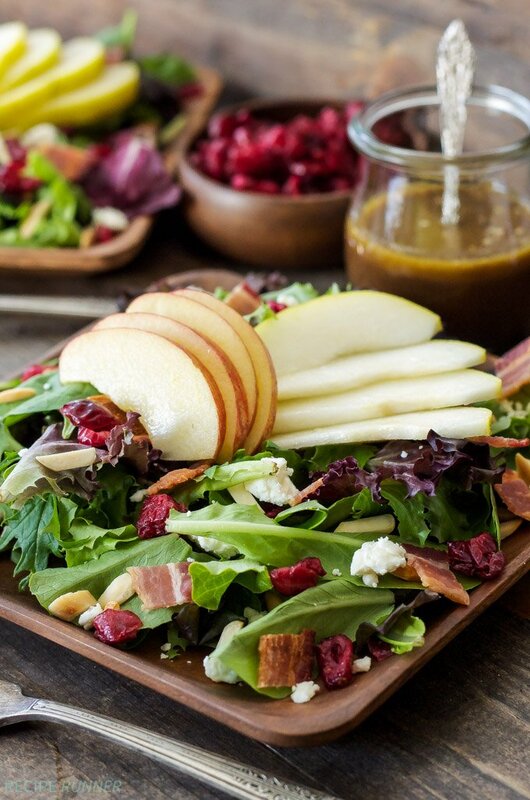 Love the apple cider vinaigrette! This is my kind of salad. I love the cider vinaigrette! Thanks Brittany. The cider vinaigrette is so delicious! This is such a colourful and pretty Fll salad!